The chartpack includes a cover page with a color image of the design. The symbol key shows which symbol is assigned to each color used. The black & white symbol chart is clear and easy to 'read'. to EMS Cross Stitch Design. 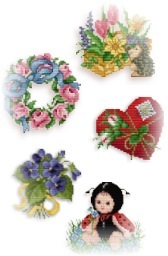 We offer high quality counted cross stitch patterns and machine embroidery designs. We specialize in floral designs and are the home of the famous Animal Babies and Bears at Work designs. 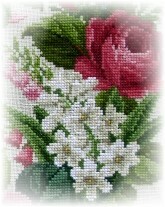 EMS Cross Stitch Designs are available at needlework shops worldwide. Please browse through the product ranges. Enjoy your stay with us! I have started a new series of home decoration designs. Cushions and bolsters with a floral motif. I hope you enjoy stitching my designs of flowers, babies, and animals as much as I did designing them. Please browse through the different areas. I feel sure you'll find just the right design to stitch for yourself or for a gift. Although my work has been stolen and published illegally thousand times, I decided to offer a new project for 2012. Each month one segment of the design will be published free for you to download. Start of the Project is 1st of January. 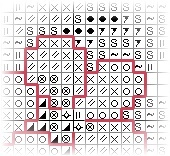 Tutorials is a new section where you will find several Stitch Diagrams, Stitch Terms explained as well as some basic finishing instructions. for some of the free projects. Forum Don't miss our community. Meet stitchers from all over the world. 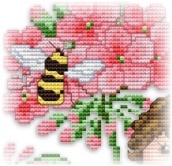 Share your love for cross stitch with other cross stitch addicts.